Phyllis Eastman, 93, of Midland and formerly of Beaverton, died October 30, 2018. She was born March 27, 1925 in Payne, OH, daughter of the late Olen and Helen (Jump) Hartman. Raised during the Great Depression and WWII, Phyllis’ family moved 13 times as her Father pursued work in the oil fields. Midland was an oasis of stability and opportunity for her. She appreciated the generosity of the Dow Chemical Company and other benefactors for giving back to the community. Phyllis graduated from Midland High School and then earned a Bachelor Degree in Physical Education at Central Michigan University. At CMU Phyllis met John “Jack” Eastman, an Air Force Pilot returning from the war. Their first date included a dance to “Elmer’s Tune” which continued to play throughout their 68 year marriage. He preceded her in death on December 4, 2016. They shared a love for music; Phyllis on piano and Jack playing the guitar. Family gatherings always included a convergence around Phyllis at the piano where old-time standards and bluegrass tunes were played with children and grandchildren often joining with their own instruments or singing along. She also performed at area nursing homes as a member of the Old Timers Band. 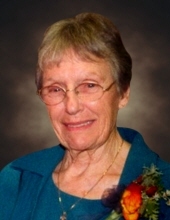 Phyllis was employed as a physical education teacher at Midland Public Schools. Phyllis promoted girl’s fitness, sports participation and coached cheerleading teams. She was beloved by her students and is remembered for her enthusiasm and creativity which spawned many new teachers. After retirement she helped develop women’s programs at the Midland Community Center and became a fixture at the Camp Neyati Girls Camp as well as Camp Outlook for Women. She performed with the Sanford Cloggers into her 80’s and played kickball with her great grandchildren this past Spring, gracefully losing a close match. Phyllis loved all things to do with family and friends. She made quilts for every grandchild, was a tremendous cook, and a consummate hostess. She loved the outdoors and nature, often enjoying long walks through the woods behind her house in Beaverton alone or with a grandchild or two. Phyllis is survived by her sons Mark (Deborah), Tad (June), Kim (Louise), and Jeff (Sharon); grandchildren Jodie (Steven Dean), Heather, John (Angela), Carly, Rachel, Sara (Christopher Rishko), Jacob, Molly, Lucas (Kathleen), Kaye, Andrew (Rene), Alexandra, and Tessa; and 9 great-grandchildren. She also was blessed with nieces Suzanne Eastman, Jane Doan and Cindy Ward, in place of the daughters she never had. Phyllis’ family will receive all wishing to pay their respects at a memorial gathering from 12:30 p.m. to 4 p.m. Sunday, November 18, 2018 at the Ware-Smith-Woolever Funeral Home, 1200 West Wheeler Street. A short service open to all persons will convene at 2pm. Those wishing to share a memory are welcome to participate. Those planning an expression of sympathy may wish to consider the Midland Camping Council (Camp Neyati) or other charitable entities focused on physical education and music. The Eastman family thanks the wonderful people at the Midland Hospital, Story Point and Mid-Michigan Home Care for their compassionate support during her final days in October. To plant a tree in memory of Phyllis Eastman, please visit our Tribute Store. "Email Address" would like to share the life celebration of Phyllis Eastman. Click on the "link" to go to share a favorite memory or leave a condolence message for the family.